“Think of a priest who does not welcome everyone. What advice would the pope give him?” Pope Francis asked. “Close the doors of the church! Either everyone or no one” should enter. With one in five Americans—over 55 million, according to the U.S. Census Bureau—growing up with some form of physical, intellectual or neurological challenge, it is unlikely that there is a single parish in the country that is not touched by the issue of access and programming for parishioners with disabilities. Yet when you look around your church on Sunday, are people with developmental or physical challenges evident? Is your parish encouraging them to be present? It is more likely that “you don’t see them because they don’t come,” says Stephen Riley. “And why don’t they come? Because they don’t get invited or they’re forced to the quiet room or discouraged from attending sacramental preparation.” It is a self-reinforcing cycle that in the end can mean further isolation from parish life for members with disabilities. Their families, perhaps infuriated or just hurt by the sense of exclusion they feel, will also disappear from parish pews, “living in the shadows” of parish life. Pulling people out of those shadows has been the work of a lifetime for Mr. Riley. He is the father of a young woman with Down syndrome and the executive director of Maryland’s Potomac Community Resources, Inc., a nonprofit that promotes the full inclusion of teens and adults with developmental differences into community life. In recent years, P.C.R. has worked closely with the Archdiocese of Washington to build unique parish-based programs for youth and adults with physical and intellectual disabilities. The CARA study offers generally good news on physical accommodations for people with disabilities. The vast majority of churches were either designed from the ground up to include access (42 percent), especially following the passage of the Americans with Disabilities Act in 1990, or retrofitted to create it (71 percent). But ramps into a church do not help people with physical challenges get to the altar to act as lectors or eucharistic ministers or give them ready access to a choir loft or even a bathroom. And extending access beyond church doors and into other parish properties remains a problem: Just over 50 percent of parish halls were deemed accessible. All the same, Janice Benton, Executive Director of the National Catholic Partnership on Disability, saw progress over “where we were five or 10 years ago” in CARA’s numbers, especially the 51 percent of parishes that reported wheelchair access to church sanctuaries. Going forward, she thinks the new data will allow her group and others working for access for people with disabilities to establish a comprehensive baseline for measuring future successes. RELATED: Read CARA's report, "Disabilities in Parishes Across the United States: How Parishes in the United States Accommodate and Serve People with Disabilities." CARA reports 87 percent of all responding parishes at least “somewhat” make accommodations for persons with disabilities for sacramental preparation such as the Rite of Christian Initiation of Adults, reconciliation, first Communion and confirmation; and over three-quarters “somewhat” offer accommodations to allow those with disabilities to participate in parish youth ministry programs. Ms. Benton acknowledges these positive notes. Still she believes “building awareness” of access and participation issues “is still huge,” pointing out that even pastors who acknowledged the need for access and accommodation often did not know how to utilize diocesan resources that would help them toward those goals. “We need to be well past asking, ‘Should a child with disabilities be prepared for sacramental life?’ or ‘Should a child be accommodated?’ That should be a given. What we should be asking is how.” She adds, “If there’s an understanding that everyone belongs in the first place, and there is, then how do you accommodate that in a way that really engages people?” Even small efforts to that end can have a multiplier effect, according to Ms. Benton, as families who are experiencing a structurally welcoming parish get the word about it out to other families who may have dropped out of parish life. Obviously the level of response on access and participation varies from parish to parish. Some are providing exemplary services. The study describes one parish that offers an Open Hearts Program that is “staffed by volunteers who have training with people with disabilities,” meeting “monthly for meal, prayer, music and fellowship.” This same parish also has a group that offers a caregivers support group and offers resources for respite services. Other parishes report struggling to pay for a wheelchair access ramp or a car service to bring the elderly or people with physical disabilities to Mass. According to CARA researchers, there are two primary factors that contribute to the extent to which parishes respond to the needs of people with disabilities: size/location and participation. Larger, suburban parishes are more likely than smaller parishes in urban or rural settings to have the financial and personnel resources “to make the kinds of accommodations needed in order to include people with disabilities on committees or in ministry roles.” It should not come as a surprise that parishes with higher levels of participation of parishioners with disabilities in ministerial roles or on committees are more likely to offer the services and access accommodations that people with disabilities need. Survey authors call that an “intersecting spiral of inclusion.” Ms. Benton likewise noted the clear “synergy” that emerges when parishes make even small efforts to include people with disabilities in ministries and parish councils. Not only does their participation lead to more inclusive outcomes in terms of parish policies, priorities and design, the enhanced visibility, she believes, allows more people with disabilities to recognize themselves in parish life and get involved. Deciding which comes first, the presence of people with disabilities on parish committees or the physical accommodations for them, is a problem that Thomas Gaunt, S.J., CARA’s executive director, says will be the focus of further study. RELATED: America's editors on "The Dignity of the Disabled"
And parishes seem to be responding to the growing number of children diagnosed with autism and other developmental challenges. Eight in 10 pastors say their parish at least “somewhat” offers a way to include students with disabilities in religious education (85 percent). About four in 10 responding parishes use one-to-one aides (43 percent), a modified curriculum (38 percent) and/or small group learning (37 percent) to accommodate children and youth with developmental or neurological disabilities such as Down syndrome or autism. Beyond helping them through the sacraments, parishes that welcome and integrate young people with developmental disabilities can fill a yawning gap that opens up just as these vulnerable teens teeter on adulthood, P.C.R.’s Stephen Riley says. Schools often provide developmentally or physically challenged youth opportunities to interact with the world outside their homes and families. But when those young people graduate from high school, those opportunities can evaporate. Mr. Riley learned that the hard way. It was precisely the experience his daughter had upon her graduation. Developing community capacity to address that looming deficit is why he first became involved at Potomac. 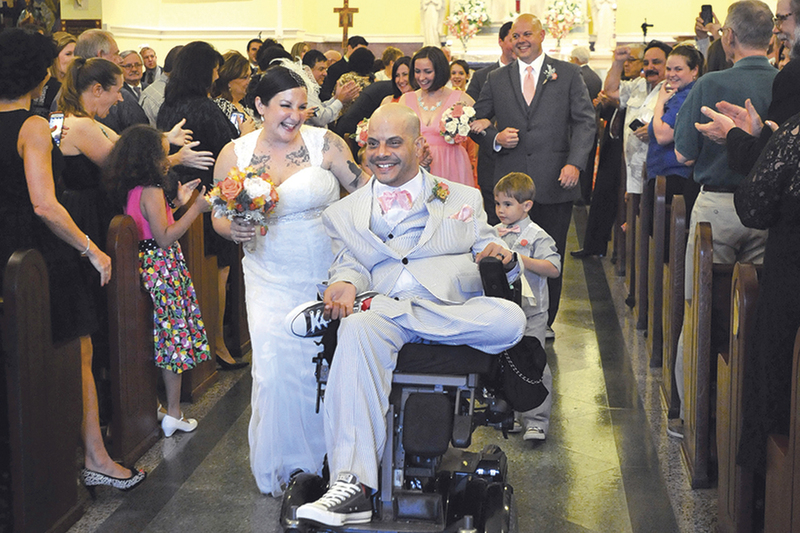 Much work remains to physically prepare parish spaces to accept people with disabilities, and more outreach and programming can help include these parishioners fully in church life. But even more work lies ahead, one parent of a Down syndrome teenager argues. Yes, families that deal each day with the myriad challenges of physical or developmental disabilities need the church’s spiritual help, but they also desperately need the church to offer practical support. Joe McGrath of Lafayette Hill, Pa., is generally satisfied and grateful for everything his parish has done to keep his daughter Maura engaged. But he is asking for more. At 17 his daughter is non-verbal and requires total care. The financial and physical challenges of parenting a child such as Maura can feel overwhelming at times, he allows. He knows people and marriages that have broken under the strain. He also knows there are many public resources available to help people with children with special needs—if they were aware of them. And that is where the church can be a big help he thinks. “Special needs fairs are something every diocese should do,” Mr. McGrath says. Though the majority of parishes reported maintaining a list of resources to refer people with disabilities for professional help, only 20 percent of large parishes said that they regularly hosted a support group for families with members who have disabilities, and only 23 percent of them reported the same on support groups for the people with disabilities themselves. Smaller parishes fared even worse. Ms. Benton agrees that parishes are still learning how to better “walk with and support families” beyond the church or parish social hall. “Minimally [parishes] should be aware of what these families’ needs are. Is there a way for the parish to help? And what would be helpful?” Respite services for often overwhelmed caregivers is an area parishes might explore, she suggests. Other parishes have created parish nurse programs; some have even sponsored housing programs for families and individuals with special needs. Though Ms. Benton was pleased to see that 27 percent of parishes reported services in Spanish for people with special needs, she thinks even more has to be done to produce and share bilingual resources for the inclusion of people with disabilities; her office is in the process of translating all of its material. Ms. Benton also highlighted outreach and service to people in the nation with hearing loss as a continuing deficit, with only three percent of survey respondents reporting services for persons with disabilities and their families in American Sign Language. Fewer than one in 20 (four percent) of parish websites were designed to be accessible to parishioners with sight or hearing loss. Ms. Benton urged anyone producing catechetical or other parish video resources to especially remember to caption their content for the hearing impaired. The new report is just the beginning of CARA’s efforts to capture the experience of people with disabilities in the church. Future analysis will further hone the depiction of that experience and suggest new areas that will require attention. What this effort does not tease out is what the church loses, according to Father Gaunt, when it does not find a meaningful way to involve brothers and sisters who have disabilities. A common starting point of the spirituality Father Gaunt has learned through participation with the L’Arche community in Washington, D.C., where differently abled people create a home together, is that “those who are disabled, brothers and sisters so often excluded and ignored, are the source of God’s grace; they are our closest encounter with Jesus.” For all the talk of what the church can do for its brothers and sisters who are disabled, Father Gaunt points out, it is the rest of the church community that is diminished by their absence. For more references, consult with your diocese or parish. Hearing loss is an invisible and overlooked disability. This disability is the most prevalent in our parishes and yet is underemphasized as a challenge for liturgical practice. One-third of all adults over 65 are hearing impaired. Liturgical practice insures that all the physically handicapped will have the Eucharist carried to them. Refusal to do so would deprive them of the real presence. We also believe that God is present in the word, but fall short in our efforts to reach the hearing impaired. For many, hearing loss is a problem of word recognition, not volume. Making sound systems louder will not help when words seem blurred together our are misunderstood. ( As an example, one time my daughter, talking about an illness, said:“pill” and I heard:“bill.”) By using closed captions, television programs alleviate this difficulty. In contrast most newscasters speak clearly so that closed captions are not necessary for word recognition. Is it too much to expect lectors, homilists and choirs, to reach the standard set by newscasters? CARA has good recommendations for the hearing impaired. Hearing loops and sign language provide much help. Even with them, there is much to be done. Lector and homilist training and support to parishes by diocesan sound system consultants, should be an urgent matter. God is present in the word as it is proclaimed. We are blocking that presence by poor liturgical practices and we are not even aware. P.S. Note for editors. I am currently writing an extended article on hearing loss and liturgy. I'm willing to expand this note, if you wish. If you are interested, I will prepare a longer article for America Magazine. Once again, we find a long and concerned article about "people with disabilities," in which autism, childhood disorders, wheelchair accessibility, deafness and even multi-lingualism are carefully dissected. Nowhere a mention of the needs of blind parishioners. Resources for the Parish listed at the end of the article omit The Xavier Society for the Blind - since 1900 providing religious and spiritual material for the blind and visually impaired at no charge. We provide the monthly Mass Propers in braille for the many blind Lectors around the country, as well as blind parishioners who simply want to be part of the parish. We also have a training handbook for blind Lectors in braille. We provide audio access to Catholic periodicals, and a quarterly review in braille of the best articles in those publications. We transcribe catechisms for children and RCIA adults, so blind people can have the same access as sighted. We have a large library of braille books, and a large library of audio materials. The biggest problem for blind Lectors isn't access to the church building but the Pastors who refuse to even give them a chance to read. And once again, when people gather to discuss and analyze making ours a more welcoming Church, every possible disability is on the list - except blindness. I suspect the comment at the beginning of the article is particularly relevant to blind Catholics - they don't come because they have gone to another Church where they have been made to feel welcome. Because they cannot see, they are easier to ignore than the sighted deaf community. People "forget" to make provisions for the blind; they are excluded as an afterthought. I am delighted that the Church is - maybe - making a more serious effort to be truly inclusive. I am, however, as depressed as I was nine years ago when I went to a Mass at St. Patrick's Cathedral in NY for people with disabilities. I found a ramp for the wheelchair reader; I found a translator on the altar for the deaf members, and there was even a deaf choir who signed a hymn after Communion. Not a piece of braille in the place - and there were a number of people with white canes or seeing eye dogs. When I commented on that, the organizers were duly embarrassed - no one had thought of it. I find the same omission in the article. And I suspect the response would be the same. No one thought of it. What a wonderful article and video! My name is Joanne Meyer and I am the parent of a 33 year old son with physical and intellectual differences. I also coordinate the Inclusion In Worship ministry for a Chicago based not for profit. We have worked in partnership with the Archdiocese of Chicago since 1996 to provide videos, print materials and $1,000 grants to help parishes welcome and include parishioners of all abilities. We have handouts about welcoming individuals with sensory, intellectual, physical and mental differences. Our videos feature how to include info in the areas of affirmation, communication and architecture. Right now we are busy assisting parishes to celebrate the annual Inclusion Awareness Days in the parishes of the Archdiocese on October 9, 2016. I hope you will visit our website at www.InclusionInWorship.org. Our materials may be helpful and our grants are nation wide. We would love to support your access and inclusion efforts. every possible disability is on the list - except blindnessIn our parish, we long had a cantor who you could see moving his hands and fingers along the book on the music stand in front of him. Apparently he was blind. Nobody made a big deal of it. He was simply one of the parish family. This article also appeared in print, under the headline "Out of the Shadows," in the August 15-22, 2016 issue. Kevin Clarke is a senior editor and America’s chief correspondent.